TheDefender® 12 Extra Wide Stainless Steel Pigeon Spike has the widest coverage of all the Defender® Pigeon Control products. If the ledge you wish to protect from roosting or nesting pigeons has a depth of up to 30 cm or 12 inches, this pigeon deterrent is the one to use. The 304 grade stainless steel pins fan out in a complex pattern, making this pigeon control spike one of the most aggressive and successful on the market. 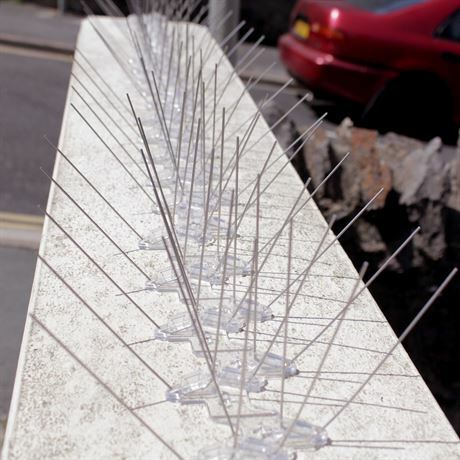 All our Defender® Pigeon Spikes are made by us, Jones and Son Pest Control Supplies, in Devon. If you are visiting the west country and have a bird spike question, call in to chat with our friendly advisers and learn how our spikes are made. Defender® 12 Extra Wide Stainless Steel Pigeon Deterrent Spikes will protect your home and business from the heaviest infestation of pigeons and birds. They will easily defend deep ledges of up to 30 cm (12 inches) from birds and pigeons trying to roost. If the ledge is over 30 cm, another row of stainless steel pigeon spikes can be added to completely protect your home and business. The Defender® 12 Extra Wide Stainless Steel Pigeon Control Spike is 33.4 cm (13 inches) long. To cover a 1 metre length, 3 strips are needed. 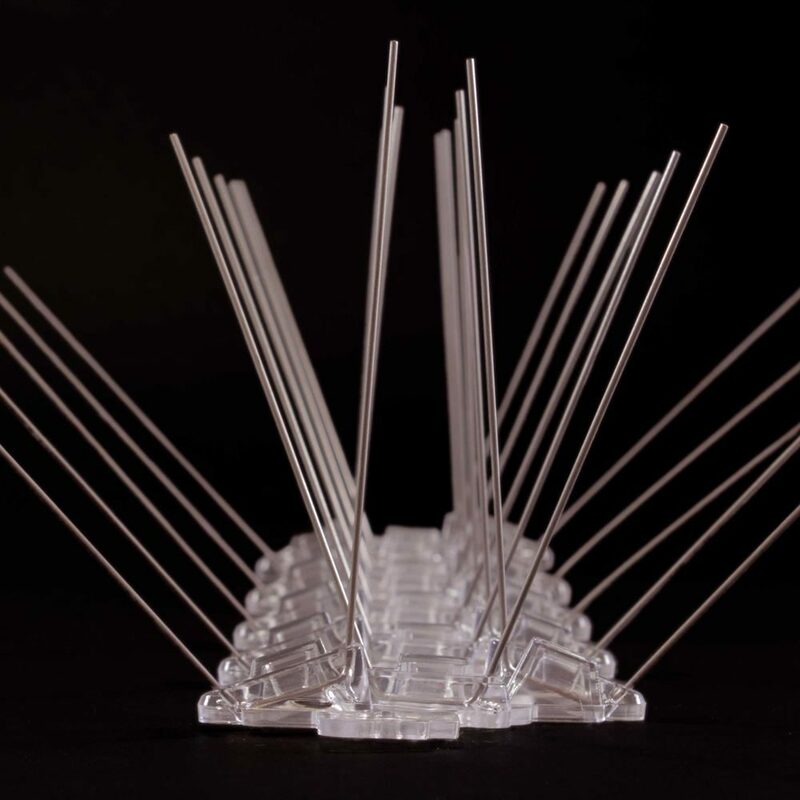 This pigeon deterrent uses a dense pattern of pins protruding from the polycarbonate base at 6 different angles to prevent birds from accessing the ledge at any point. The Defender® 12 Extra Wide Pigeon Control Spike is recommended by the RSPB as a very humane way of deterring birds. The blunt 304 grade stainless steel pins fan out at 6 different angles to prevent pigeons from approaching the ledge. These protruding pins do not touch the bird or harm it. 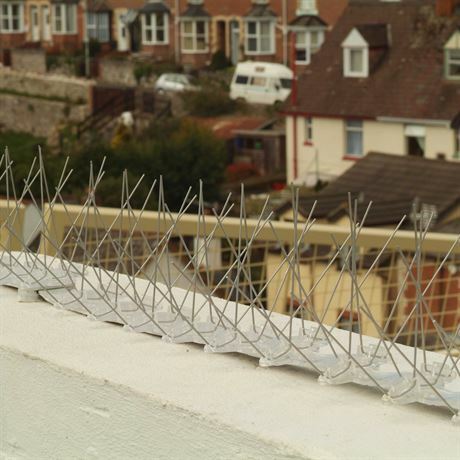 The pigeon deterrent spikes simply deter the birds from landing, and move them on safely without injury. The most effective way to install Defender® 12 Extra Wide Stainless Steel Pigeon Spikes is to use the specifically designed Defender® Pigeon Spike Fixing Silicone. This adhesive is formulated to create an extra strong bond with the polycarbonate base. However, nailing or screwing the pigeon spike strip into place can also be effective, utilising the special silicone fixing holes in the base. Click here to view Defender® 12 Extra Wide Stainless Steel Bird Spikes - Installation Guide It is important to check the suitability of surfaces for use with Defender® Silicone. For more information, please visit the product page Defender® Fixing Silicone Adhesive Glue. The Defender® 12 Extra Wide Stainless Steel Pigeon Control Spike has 10 cross shaped holes in the base. When Defender® Pigeon Spike Fixing Silicone is applied to the underside of the base and the base then pressed firmly onto the ledge, the glue will exude through the holes and form cross shaped rivets that lock the stainless steel pigeon spike in place. The Defender® 12 Extra Wide Pigeon Deterrent Spike has a base manufactured from Durolon, a UV stabilised polycarbonate material which does not become brittle or discolour over time. There are 30 stainless steel pins made from premium 304 grade steel inserted into the base at 6 different angles. This grade of stainless steel is guaranteed not to rust and therefore comes with a 25-Year “No Rust” Warranty. Along the underside of the base of theDefender® 12 Extra Wide Stainless Steel Pigeon Spikes are 4 grooves, which can be snapped by hand to create 5 shorter lengths, each measuring 6.5 cm and each having the correct 6-angled span of pin protection. This means smaller ledges and uneven surfaces can be securely protected from persistent pigeons and birds. The Defender® 12 Extra Wide Steel Pigeon Control Spikes come with a dependable 25-Year Warranty, guaranteeing no rust once in situ. The 304 grade stainless steel wires are a superior grade that will not corrode in the elements. These wires protrude from a Durolon UV stabilised polycarbonate base, which again withstands extreme weather without degradation. You may find that the lower quality pigeon spikes available on the market can rust in a matter of years, so always look for our warranty-protected UK manufactured Defender® Stainless Steel Pigeon Spikes. Defender® Pigeon Control Products are made by Jones and Son Pest Control Supplies Ltd in Devon, UK. They are invented, designed, produced and manufactured in house to ensure high quality pigeon control systems. In fact, the Defender® 12 Pigeon Spike is probably the only stainless steel spike in the world that has 6 separate rows of pins. 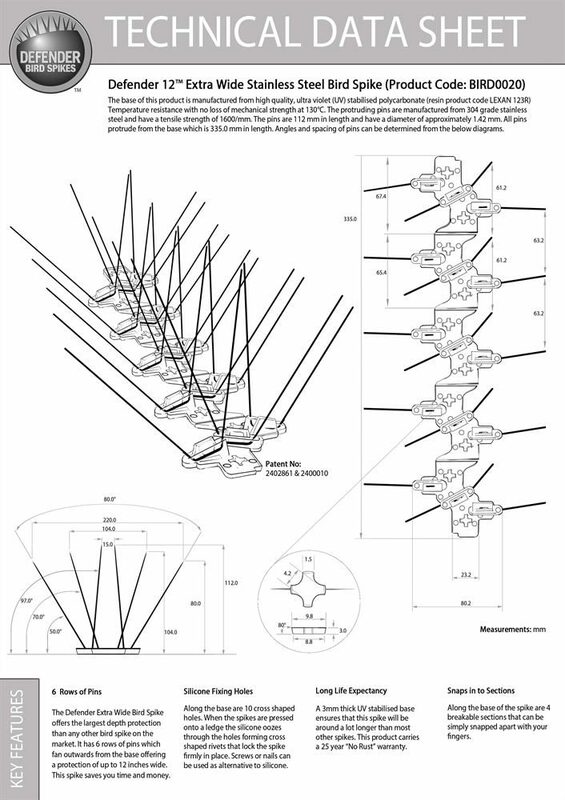 For a Technical Data sheet for the Defender® 12 Extra Wide Stainless Steel Pigeon Deterrent Spike, please click on the image on the right to view a PDF, which you can print for reference if required. Our Defender® 12 Stainless Steel Extra Wide Pigeon Spikes have helped people quickly and easily get rid of pigeons and birds humanely from their homes and businesses. Read Bird Spike and Pigeon Spike Reviews. If you have a "How to deter pigeons" question, please contact us and we will get back to you to help resolve your pigeon control issue.